This past week, my Algebra 1 students started Unit 3 which is an introduction to all-things Functions. Unit 4 is all about linear functions and graphing. So, Unit 3 is about how to represent relations, how to determine if a relation is a function, how to find the domain and range of a function from a table or a graph, and how to evaluate functions. It's a nice change of pace from the weeks and weeks we've spent solving equations and word problems galore. I ended up spending an entire 52 minute class period on representing relations. This frustrated me because I thought it would only be half a class period. But, you know how those things go sometimes... The next day, I introduced students to the definition of a function. We made a few examples and non-examples in class together. Now, normally when I would teach this lesson, my next activity would be a card sort where students sorted relations in to functions and not functions. In the past, this has always been super frustrating because too many kids just sit there and say they don't know how to tell if something is a function or not. So, I decided to put the card sort off until the next day and find a practice activity to do to finish out the class period. Five minutes before class started, I still wasn't sure what this practice activity was going to be. I wasn't super worried because I had a fall back option - mini dry erase board practice. But, I still hoped I'd think of something more exciting. At the last minute, I thought back to an activity I had done as a first year teacher - a solving equations review auction. I decided I could easily tweak this and make it into a function auction. Various relations would be put up for auction. 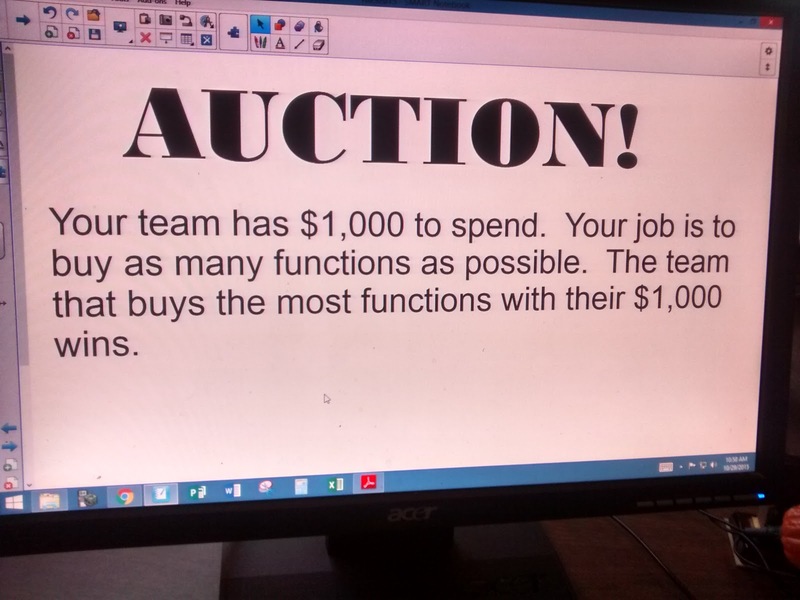 Students would be placed in teams whose goal was to buy as many functions as possible at the auction. And, for an "auction catalog," I printed of a worksheet from the internet. You could very easily make your own, but I like to do things at the last minute. I liked this worksheet because it had tables, ordered pairs, graphs, and mapping diagrams. Since my desks are already arranged in groups of four, I made these into the groups for this competition. 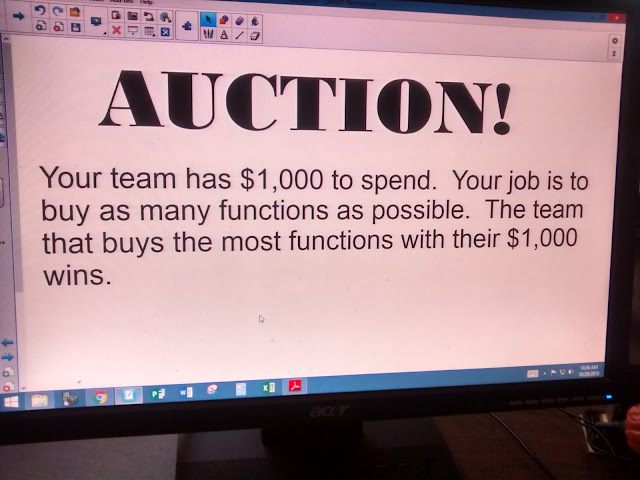 I explained that there would be an auction, and each team would be given $1,000. The team that purchased the most functions with their $1,000 would win candy. I asked how many students had been to an auction before, and most had. I asked them if they knew what an auction catalog was. They didn't, and several claimed cattle auctions don't have those. I passed out the "auction catalog" to each group, and I purposefully gave each group only one copy of the catalog so they would have to work together. Then, I gave them a few minutes to look over the "catalog" and decide on which lots they would be bidding on. It was so fun to walk around the room and watch the kids justifying their reasoning to each other as they discussed which relations they wanted to purchase. I think I got a lot more engagement out of my students by structuring the activity in this way than if I had just put the problems up one-by-one on the SMART Board. After running the auction with my first Algebra 1 class of the day, I decided the activity needed a bit more structure to make the auction run smoothly and efficiently. I instituted a minimum opening bid of $50. And, I made it so each bid had to raise the previous bid by at least $20. This made things run much better for the rest of the day. Before running this activity, I intentionally did not introduce my students to the vertical line test for determining if a graph is a function. It was fun to see several groups come up with the test on their own just based on the definition of a function having exactly one output for every input. In two of the class periods where I ran this function auction, two groups had purchased the same amount of functions. Therefore, it's probably important to come up with a rule for how to break ties. I like to declare the group with the most money left as the winner. There was the fun-to-watch auction drama of groups not paying attention to what was being auctioned and bidding because they thought we were on a different problem, one member of the group raising the bid way higher than the other groupmates thought they should go, and the smug looks of the members of one group when they realize they are going to get the function for the opening bid of $50 because all of the other groups think it isn't a function. Another favorite - a room silent enough to hear crickets when you ask for opening bids for a relation that isn't a function. :D The kids came in the next day begging to have another auction. That's what I call a successful, low-prep, high engagement activity! I am totally going to steal your auction idea! Not sure how I'm going to use it, but I love it! When I saw this on twitter I knew I wanted to use it! An auction the way you have this set up takes little explanation for students, so they can get started right away :) I can't wait too try it. The bidding strategy makes this so fascinating! I also really like that you gave them the catalog first and encouraged that group talk--less pressure for them than having to decide in the moment, and good for generating math talk. I've done an auction thing like this in the past... and had issues with students trying to be silly and spend all their money on one question. I offered candy to the winning team. I wonder if that helped... Also, my kids are super competitive. But, I've definitely tried activities where my kids were silly and they just didn't work. I think you just have to know what works for your kids. What a fun activity! Thanks for sharing the idea! I saw this Monday, and we planning to teach this section on Wednesday! Perfect timing. I did this with my advanced kids and it went well with great conversations in the groups. I then did it with my average class. At first I was frustrated because they were not trying to discuss it. They bought lots of non functions. However, when we went over the answers to determine the winner, they learned a ton! (One kid said, oh, now functions make sense!). It was a great activity. Thanks for a wonderful, engaging idea. We paused after each to announce if it was a function or not. I wonder how that would have changed the activity for your on-level class? Glad to hear the activity worked well for you, though! Thanks for reading my blog, Leeanne! I am so excited to share this activity with my Algebra 1 kiddos tomorrow. So as I was building excitement for the activity, I said, "You know the math lady I follow online? Yes, the one with the cats. Well, I have borrowed another activity and tomorrow we are going to have an auction!" Love your blog! Love your ideas! Thanks for sharing! BTW.... I talk about you all the time to my classes and always give you credit for the great stuff we get to do because of you! - From a fellow small school Okie math teacher! Oh my goodness - this comment definitely made me LOL. Thanks for reading my blog! I really enjoy reading through all of your blog posts about the different activities you incorporate in class. You really enjoy making sure that you have engaging lessons to make sure students are learning information in many different ways. I am a college student graduating soon, and although I have an elementary degree, I still feel as though I can switch up the content being taught but definitely still use the activities you provide. 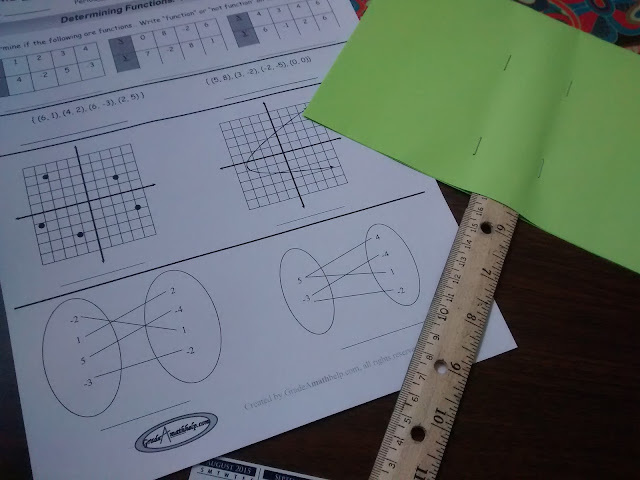 I am a tad scared to teach math in my future classroom but finding ideas like yours makes me very excited for the possibilities I could add in my lessons to make them more engaging. We talk a lot in my math class about teaching concepts through step by step processes and I feel that the way you introduce topics and bring them together with the activity is a great example of that! Thanks for the sweet comment! It means so much to me that you've been reading my blog! I wanted to thank you for your posts! I did the function auction today with my small group algebra 1 class and it was a hit! The kids said they'd never had so much fun in a math class before and asked if we could do it again. I appreciate your posts because they have allowed me to connect with my class and bring math alive for them. Thank you so much for sharing this idea! I used it last week with my students and they loved it! Thanks for all that you do! You're welcome! Glad to hear your students loved it! I'm glad I stuumbled across this! I adjusted it for linear equations. I gave my students a "catalog" of graphs and gave them about 10-15 minutes to write equations. Then I auctioned off equations and they had to buy the correct equations. My kids loved it and they keep begging me to do it again. So I made another one for systems. I'm excited to see how it goes, as that one is a bit more complicated. Awesome! Any way you could share your files? Does every lot have to sell? Like when you get crickets because they all know it's not a function, do you move on? Or do you wait for one group to take one for the team before you let them move on? If nobody wants to bid on a lot, we talk about why it wasn't a function and move on. Used this today with my Algebra 2 students as a review and it was a huge hit! thank you for sharing the awesome idea! Students asked if they could have an auction every Friday! Glad you and your students enjoyed it! This looks awesome! I haven't been to an auction though so trying to figure out how to do it in class. Do you give every child an auction paddle or just one per group? Do they get to keep the auction "book". Love your site. Thank you so much for sharing!